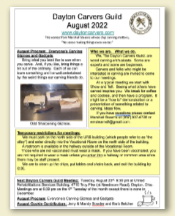 Dayton Carvers Guild's newsletter is edited by Jan Fader and is published monthly. Click a link in the index at the left to read that newsletter. Control-click (right click) the link to download that newsletter.